Born in Evansville, Ind., Avery Brooks (1948 - ) moved to Gary when he was eight years old. About Gary, Brooks has said, "I was born in Evansville, but it was Gary, Ind. that made me." Mr. Brooks graduated from Gary Roosevelt High School and attended Indiana University and Oberlin College. Transferring to Rutgers University, he completed his bachelor&apos;s in 1973 and earned a Masters of Fine Arts in 1976, becoming the first African American to receive an MFA in acting and directing from Rutgers. Mr. Brooks has enjoyed success in television, film and theater and is best known in popular culture for his role as Captain Benjamin Sisko on the science fiction television series "Star Trek: Deep Space Nine." What appealed to Brooks about the role was the opportunity to give hope to young people. "Today, many of our children, especially black males, do not project that they will live past the age of 19 or 20," he commented to a journalist. "Star Trek allows our children the chance to see something they might never otherwise imagine." Avery Brooks&apos; first love, however, is the theater. He received critical acclaim in Phillip Hayes Dean&apos;s play "Paul Robeson." Brooks portrayed the famous singer, actor and civil rights activist in a one-man biographical drama. He has performed the role since 1982 at the Westwood Playhouse in Los Angeles, the Kenny Center in Washington D.C. and the Longacre Theater on Broadway. Throughout his entire career, Mr. Brooks added his own dimension to his character interpretations, from Hawk ("Spenser: For Hire") to Captain Sisko to Paul Robeson, often exploring new ways to portray icons, such as Malcolm X and Willy Loman in "Death of a Salesman." 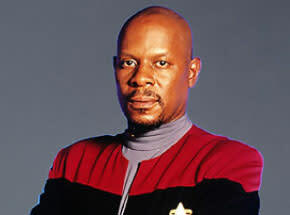 Avery Brooks has won numerous honors and awards, including the NAACP Image Award and induction into the College of Fellows of the American Theatre. Several universities have recognized him with honorary degrees, including Indiana University Northwest. Even with his fame and success as a performer, Avery Brooks has not forgotten his roots in Northwest Indiana. He has returned to the area on a number of occasions to inspire youth and serve as a role model for young people. As the late Reverend Dr. Robert Lowery, St. Timothy Community Church in Gary, observed, "He has given of himself to programs that have raised the aspiration and achievement level of those whom he has touched." Avery Brooks was nominated by Stephen G. McShane, Archivist/Curator, Calumet Regional Archives, Indiana University Northwest. "That&apos;s one for the Gipper"
Jack Chevigny (1906 - 1945) was a Notre Dame football star who figured prominently in the "One for the Gipper" legend in Yankee Stadium. In the Notre Dame v. Army Game of 1928, Chevigny scored against Army after hearing Knute Rockne&apos;s famous "Win one for the Gipper" halftime speech and yelled, "That&apos;s one for the Gipper" as he crossed the goal line. He was born in Dyer and attended Hammond High School. He was called "The Flash." He attended Notre Dame from 1924 to 1928 and received his law degree in 1930. In college, he was described as a "great blocker and brilliant defensive player." Later as a coach, he led the Chicago Cardinals of the NFL. At the age of 28, he led the Texas Longhorns to the precipice of a national championship, only to have his coaching career shattered by two consecutive losing seasons in Austin. He served in the U.S. Army as a corporal, and then became a 1st Lieutenant in the U.S. Marine Corps. As a Marine officer, he accepted the challenge of establishing Camp Lejeune as a premier football program. Under his guidance, Camp Lejeune&apos;s football program became the "jewel" of the Marines, but Chevigny, a close friend of Marine Commandant General Vandergrift, requested combat duty in January 1944. He was assigned to the 27th regiment of the Fifth Marine Division which went overseas in the fall of 1944. He was killed leading his assault team onto the eastern beach of Iwo Jima on February 18, 1945. His story is documented in a book titled, "The Last Chalkline: The Life & Times of Jack Chevigny" by Jeff Walker. In describing him, Mr. Walker said, "Jack had little patience for inefficiency or incompetence. He was less a negotiator and more of an activator. He enjoyed the spotlight but held private certain aspects of his life. For example, few people knew that his talents included sketch artistry. Writing his letters, he was particularly fond of decorating the margins with sketches of nature. What was commonly known about him was his remarkable wealth of charisma. Although he wasn&apos;t imposing ... Jack&apos;s presence was such that it was said by numerous people that when he walked in the room, all conversations stopped." John "Jack" Chevigny was nominated by Dave Kornaus, Santa Barbara, Calif. and formerly of Hammond, Ind. Sue Hendrickson (1949 - ) was born in Chicago and grew up in Munster. She described herself as a "shy little girl." She said she enjoyed going to school and always wanted to know more. She read almost "anything I could get my hands on," usually finishing a book a day. Her earliest memory of finding "treasure" is when she was around 4 years old. "I loved wondering down the alley, poking through the wire bins that held ashes of burned garbage," she said. One day, she pulled out a small brass perfume bottle. "I&apos;ve kept it to this day," said Hendrickson. She left Munster before completing high school and became a diver in the Dominican Republic in the mid-1970s. 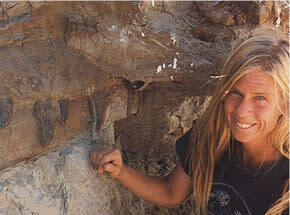 In 1985, she met Peter Larson, president of the Black Hills Institute, while in Peru on a whale dig. She soon began volunteering with Pete&apos;s group, digging for fossils in the U.S. and working for them for three summers in South Dakota. The summer of 1990 began in much the same way as the previous summers had begun. Just two days before she was to leave the site, a tire on her truck went flat. When the four others in the group left to get it fixed, she stayed behind. Throughout that summer, she had searched most of the cliffs in the area. But there was one spot she had never gotten the chance to visit. "With the others gone, this was my chance. I set out across the valley, accompanied, as usual, by my dog Gypsy. I walked around the base of the cliff with my head down, watching the ground." About halfway along the path, she noticed a few pieces of what looked like bones. "Then I looked up. It&apos;s difficult to put into words how I felt at that moment. There about eight feet above my head, were three dinosaur backbones. I could see them clearly in the sunlight, as though waiting patiently for someone to find them." The walk back to her group&apos;s base that day remains a blur for Sue. It took her team five days to remove the 30 feet of rock that covered SUE&apos;s skeleton. She said, "In less than three weeks SUE was free from her rocky tomb. Back at the Hills Institute, workers began the long process of cleaning bones. Because SUE was so extraordinary, many people wanted to claim her. For $8 million, the Field Museum earned the right to call SUE their own." The first T.rex specimen was found in 1900. Since then, only seven skeletons that are more than half complete have been discovered. Of these, SUE is the largest, most complete and best preserved T.rex ever found. It is on display at The Field Museum of Natural History in Chicago. Sue Hendrickson was nominated by Nancy O&apos;Shea, Public Relations Director, The Field Museum and John Davies, Assistant Director, Gerald I. Lamkin Innovation & Entrepreneurship Center, Ivy Tech Community College.